Spring is here, so now is the time to make your home look brighter and more cheerful. 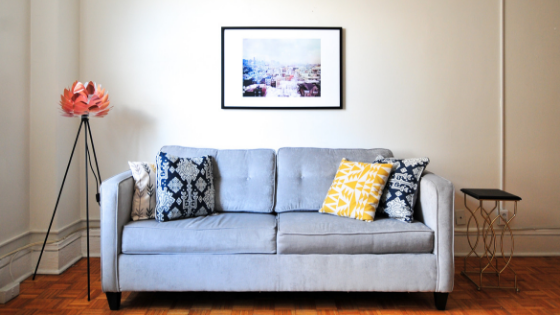 These easy to follow decorating tips will help you turn your living room into a fun and attractive place to spend time this spring. Dark drapes can make your living room seem stuffy and gloomy at the same time. Take them down and install light, cottony curtains. When choosing a curtain material, look for whites, creams, or soft neutral colors like gray. Use a simple ribbon to hold the curtains open during the day, then let the curtain down at night for a little more privacy. Spring is a time when many people go out into the world for exercise and entertainment. If you're spending time in a park or at a beach, pick up elements of nature while you're there. Bring home seashells, beautiful stones, or fresh flowers. Alternatively, you can also decorate your living room with attractive houseplants and fresh cut flowers from the florist. Disperse these natural elements thoughtfully around your living room; avoid clustering them all in one location. This creates a sense of balance in your home. Mirrors bounce light around the room and keep the space bright. Install mirrors in attractive frames on your living room walls. Mirrors can be especially effective in dark corners and when positioned across from large windows. If the mirrors aren't brightening your living room enough, hang twinkle lights near the mirrors to create beautiful, sparkling reflections. Clutter can make your home look smaller than it really is. Clear away clutter to make your living room look spacious and clean. To clear away the clutter, start by eliminating any stacks of mail, pens, and toys. Put away all the DVDs. Finally, limit the number of knick-knacks and other items in your living room. The Residences at Springfield Station welcomes new residents! To find out more about how you can see our apartments in Springfield, VA, call us today.